General Condition: Call for details. Exterior: White with silver and burgundy accents. Electronics: Satellite, rear video monitor, TV antenna with inside controls (tv's missing), refrigerator, ice maker, microwave. 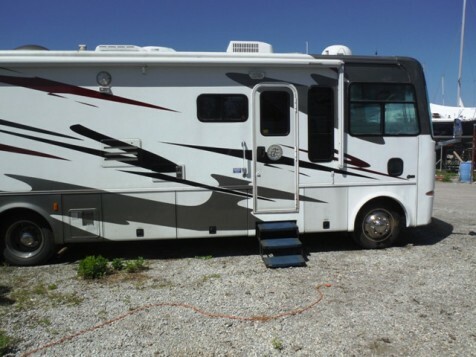 Equipment: Spare tire, limited slip axle, trailer hitch, driver side door, tilt wheel, monitor panel, furnace, A/C, Onan 7000 watt generator, 12 volt reciruclating toilet, waste disposal system, waster water holding tank, stabilizing jacks, awning, ladder.